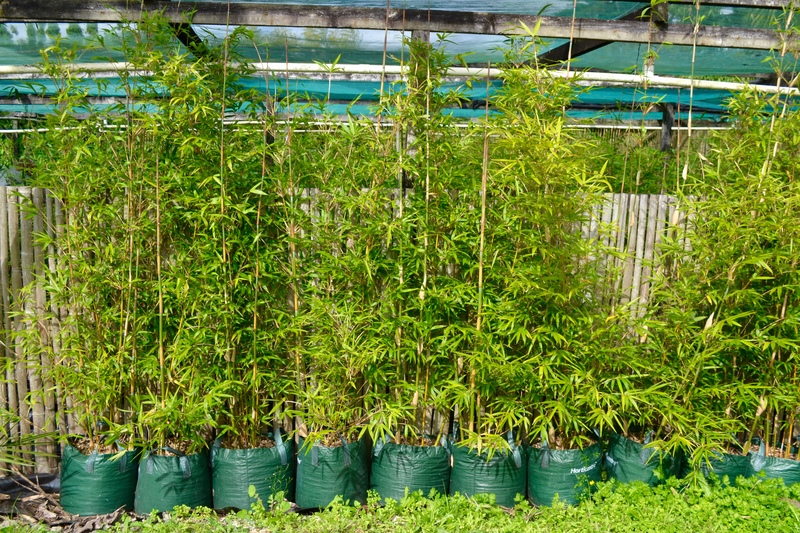 Plant spacing for screening, should be approximately the same distance apart as the space you have available/the width you would like them to grow, if your space is narrow/limited. 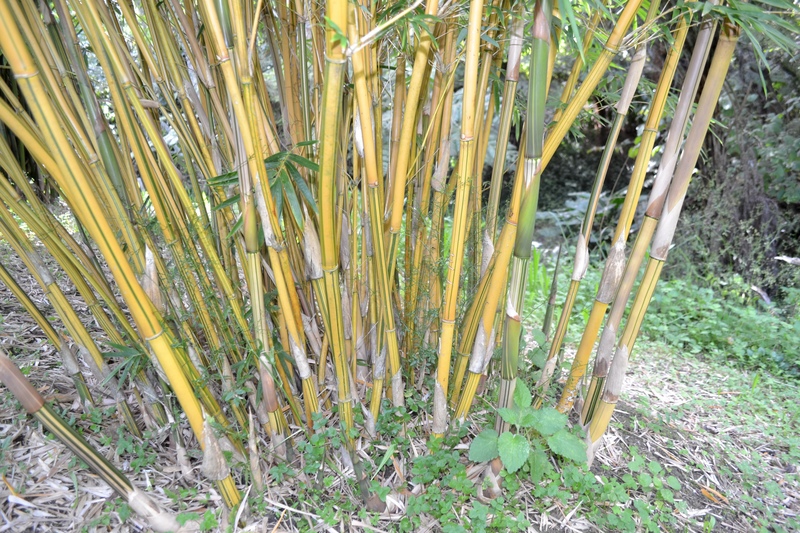 Otherwise in normal circumstances 0.5 – 1m apart for small – medium size types, and 1.5 – 3m apart for B. oldhamii. 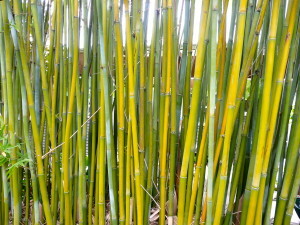 small leaves, attractive green canes with cream/yellow stripes, makes great mid-height screen, can be trimmed easily. 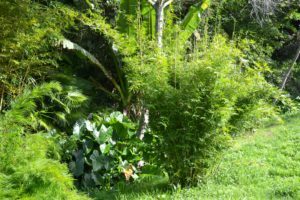 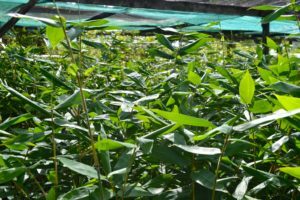 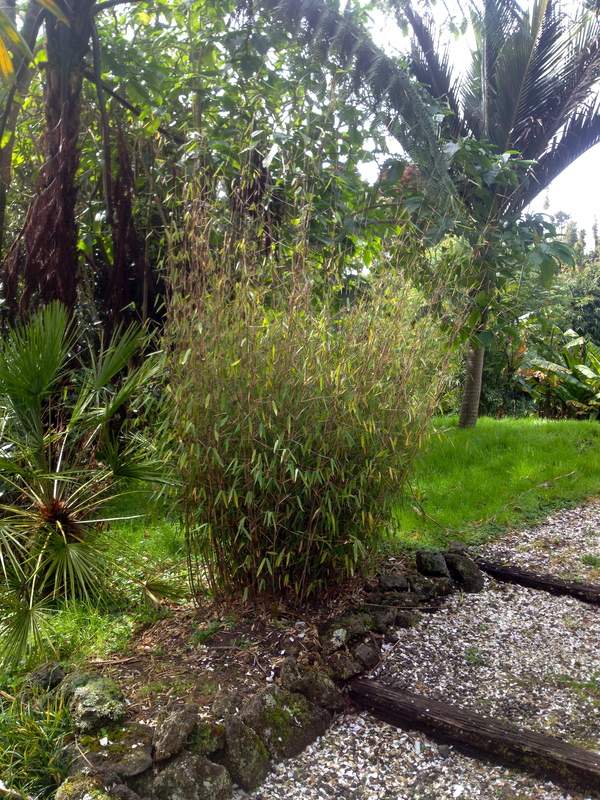 Being a Bambusa multiplex, these are particularly tougher with managing more extreme conditions (even though it’s still definitely not ideal) like flooding or overly damp soils, drought, extreme cold, extreme heat, wind etc. 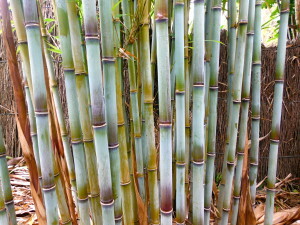 prefers moist, well drained, fertile soil. 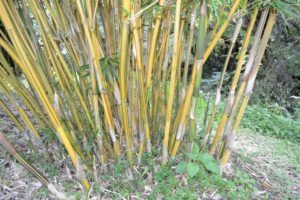 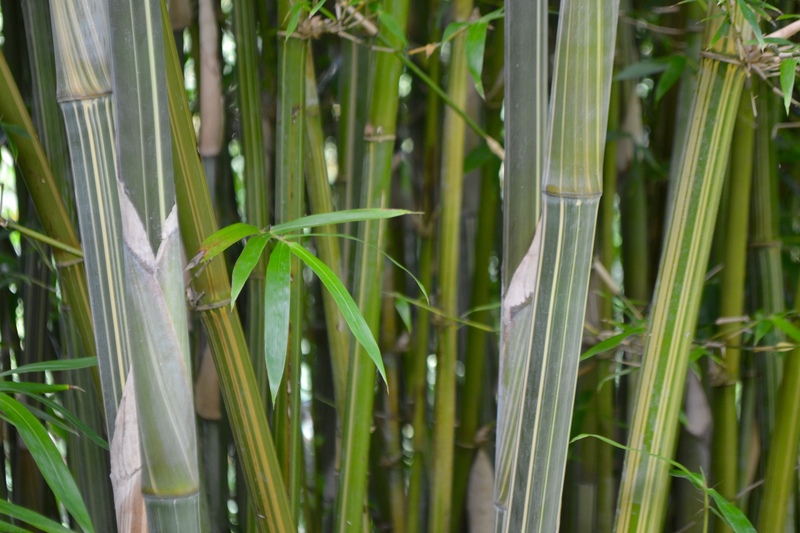 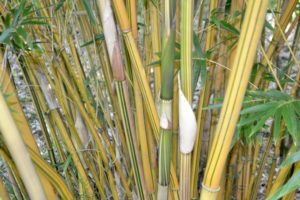 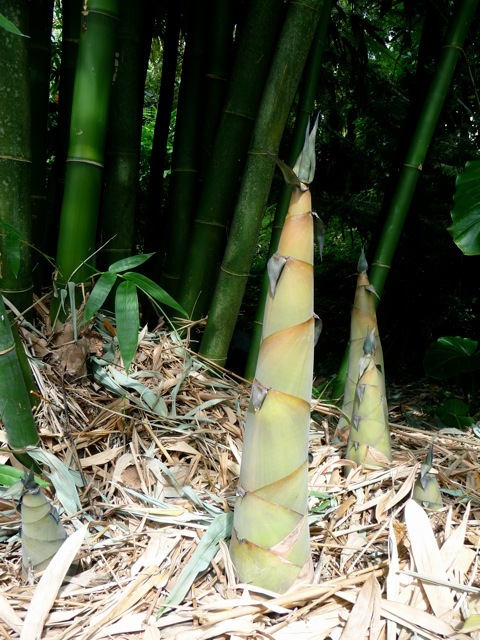 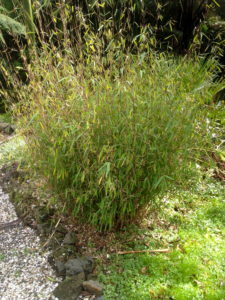 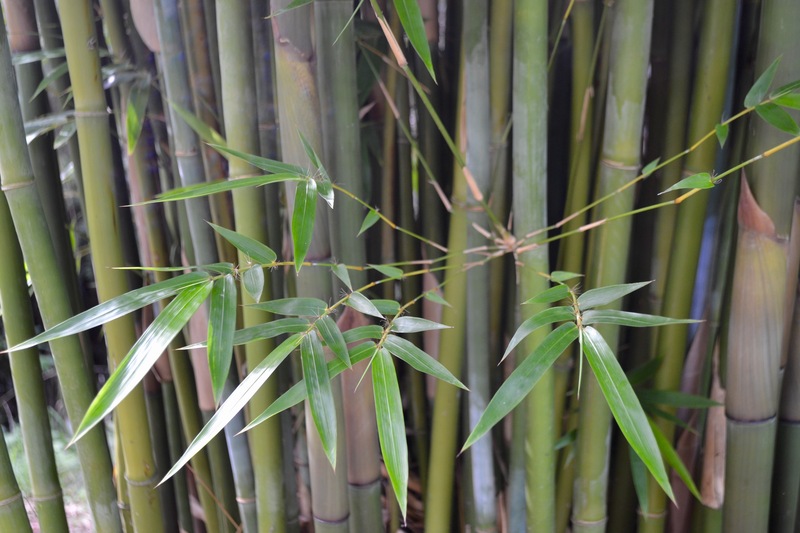 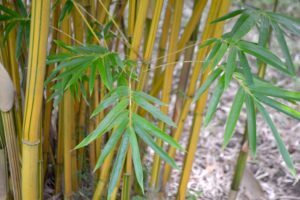 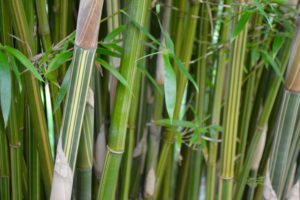 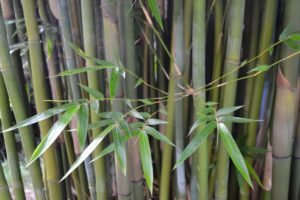 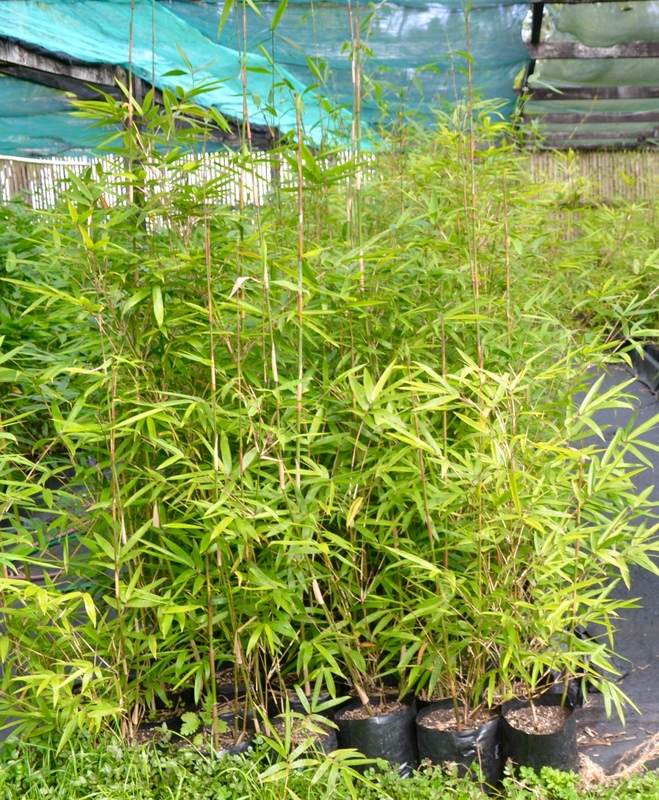 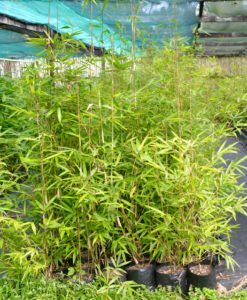 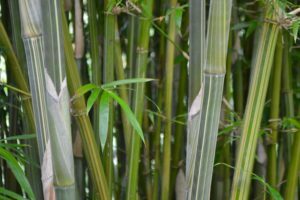 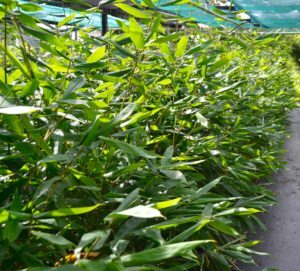 small leaves, attractive bright yellow canes with green stripes, new shoots and growth is bright red – pink (this is a very colourful bamboo). 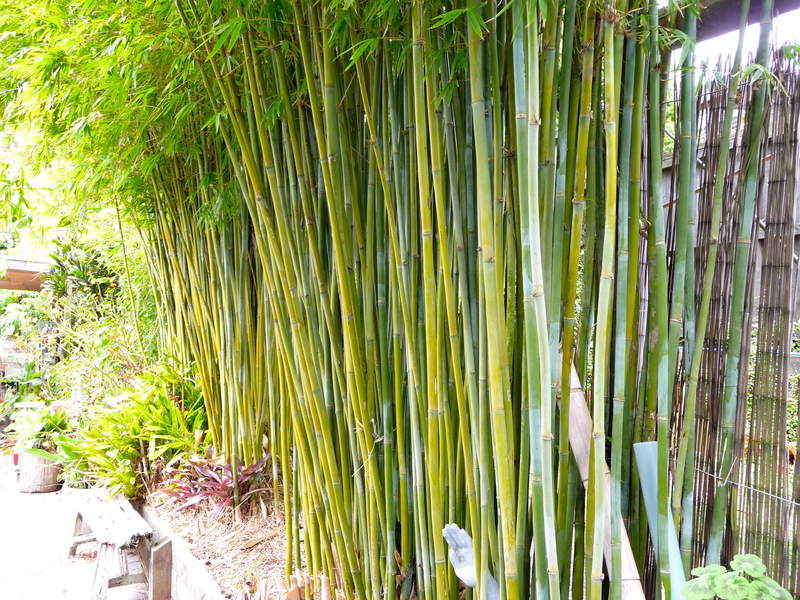 makes great mid-height screen, can be trimmed easily. 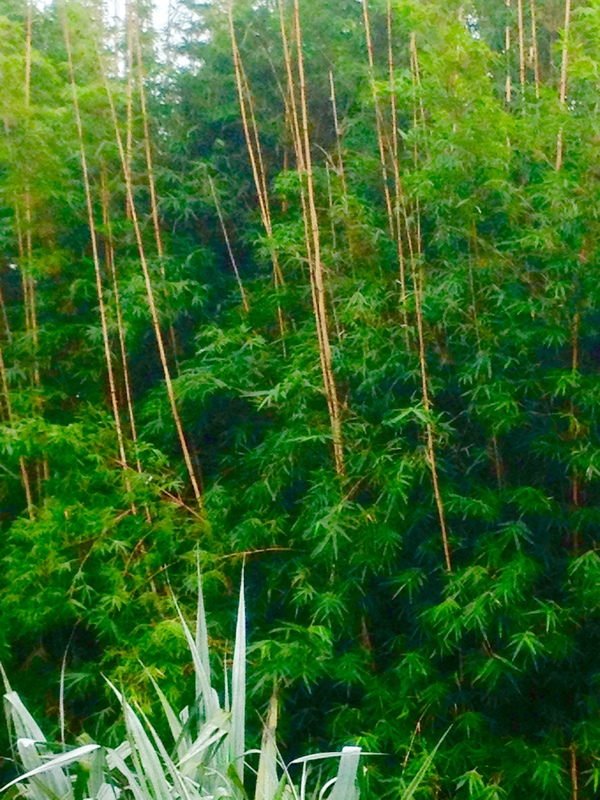 prefers moist, well-drained, fertile soil. 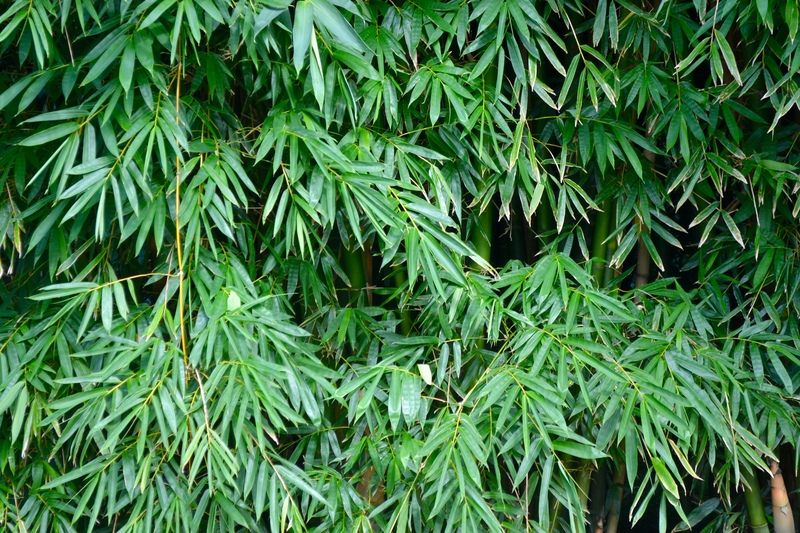 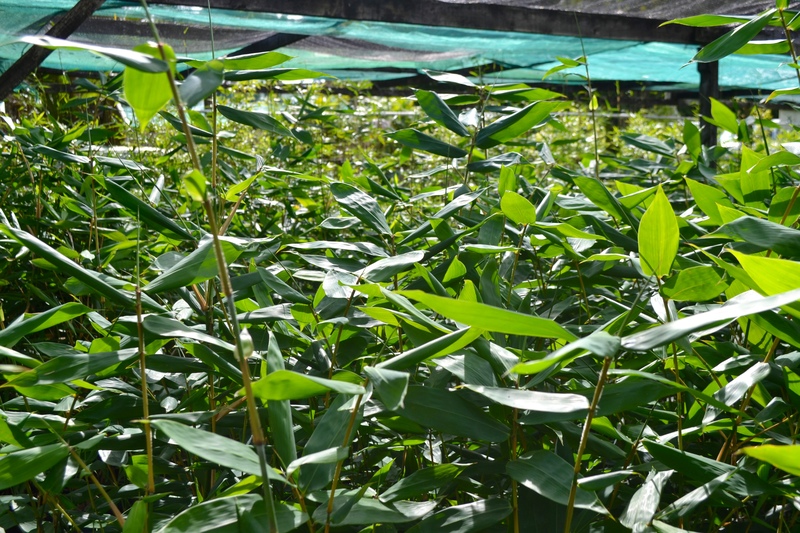 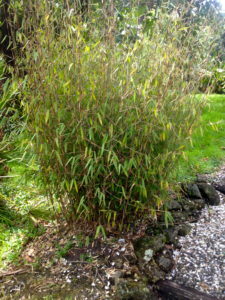 This bamboo is generally an all green bamboo, despite the name. 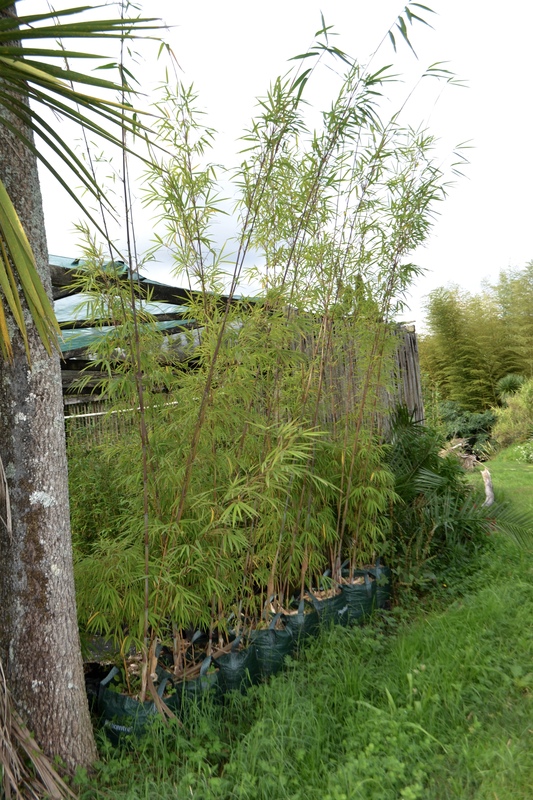 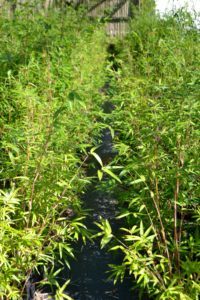 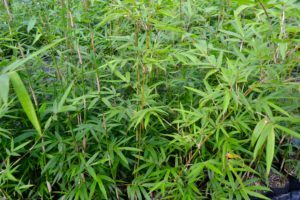 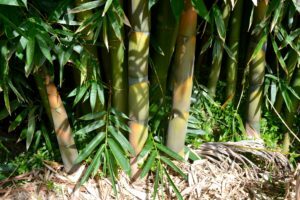 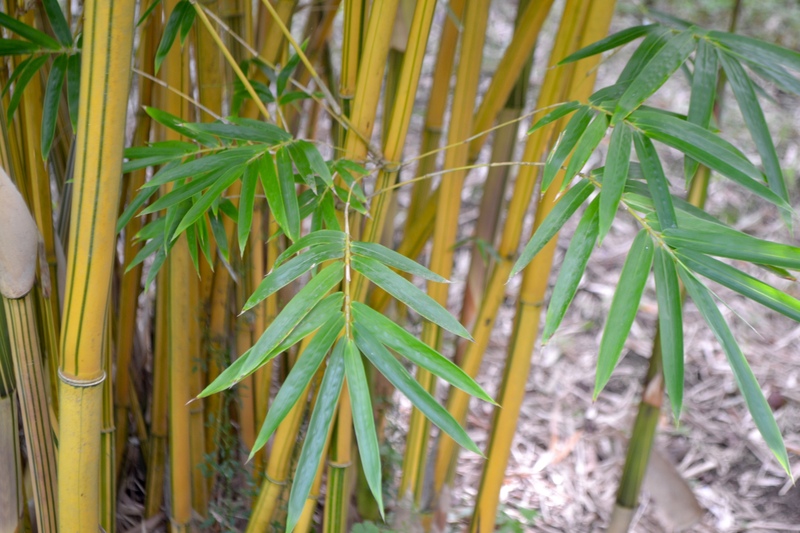 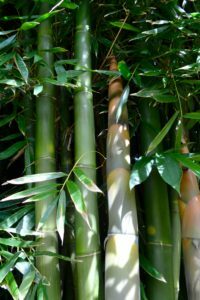 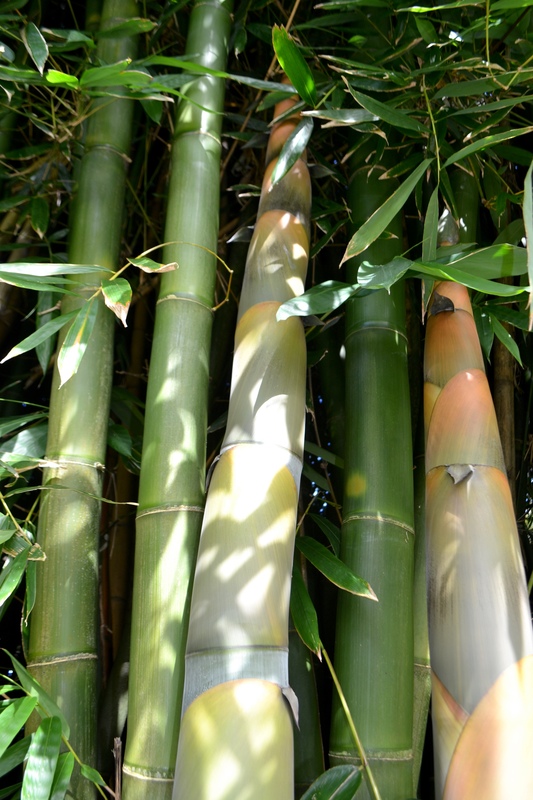 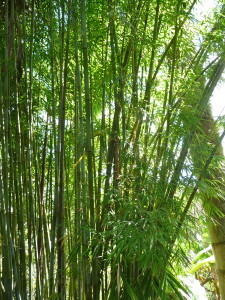 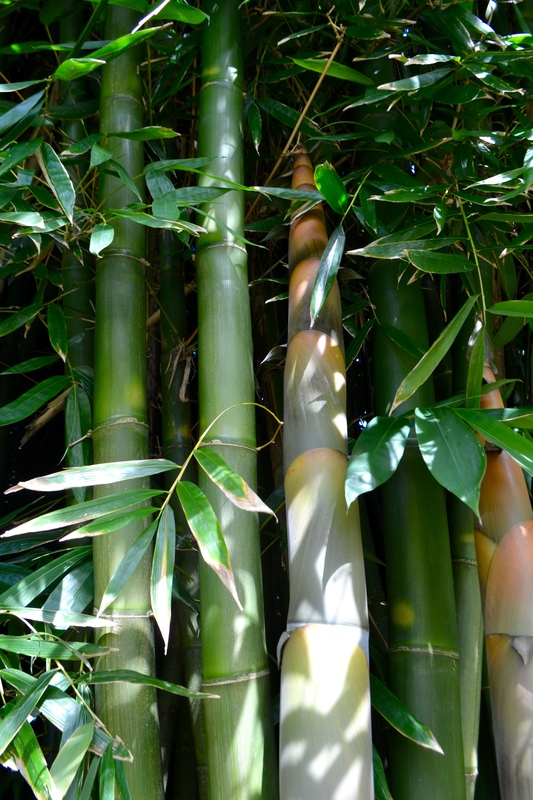 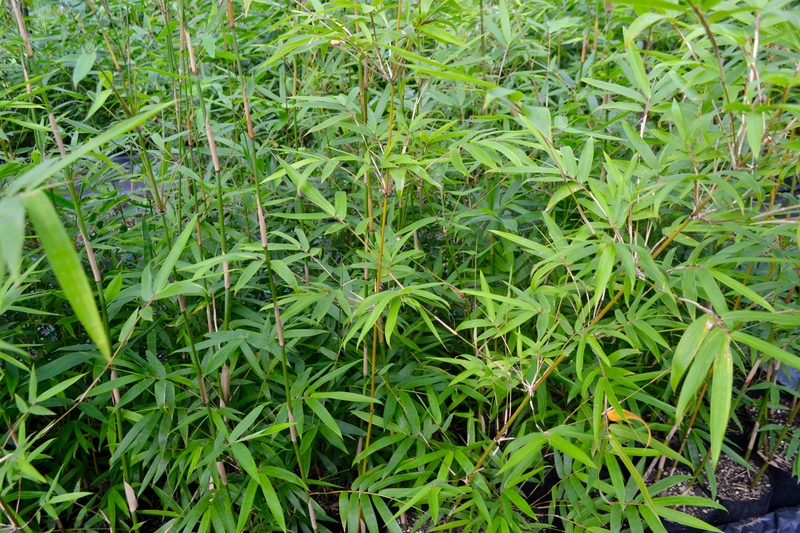 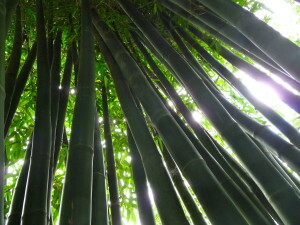 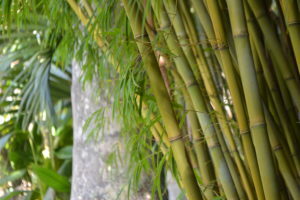 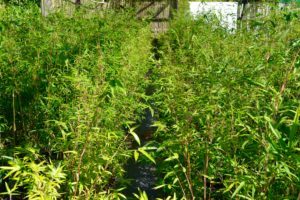 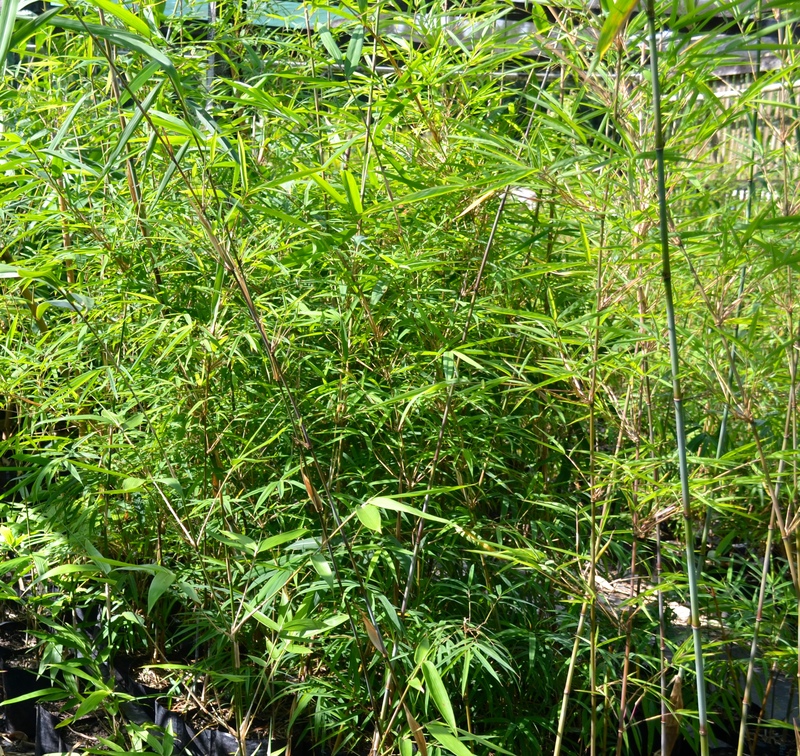 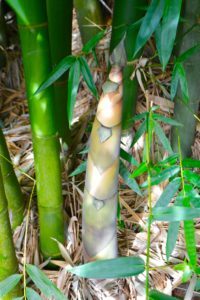 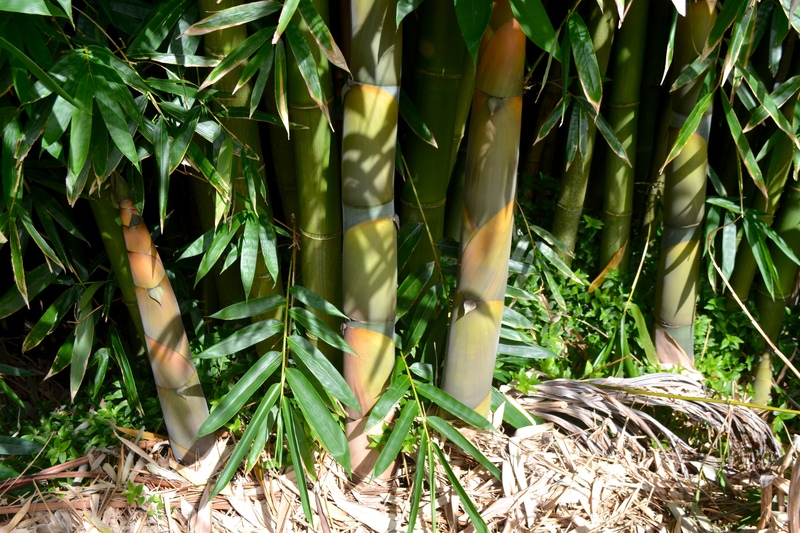 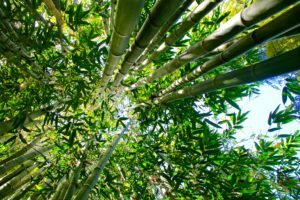 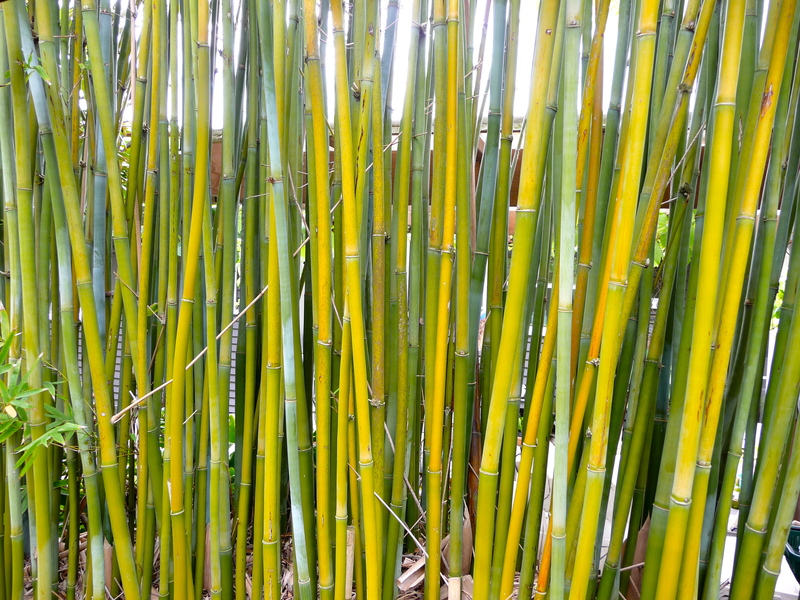 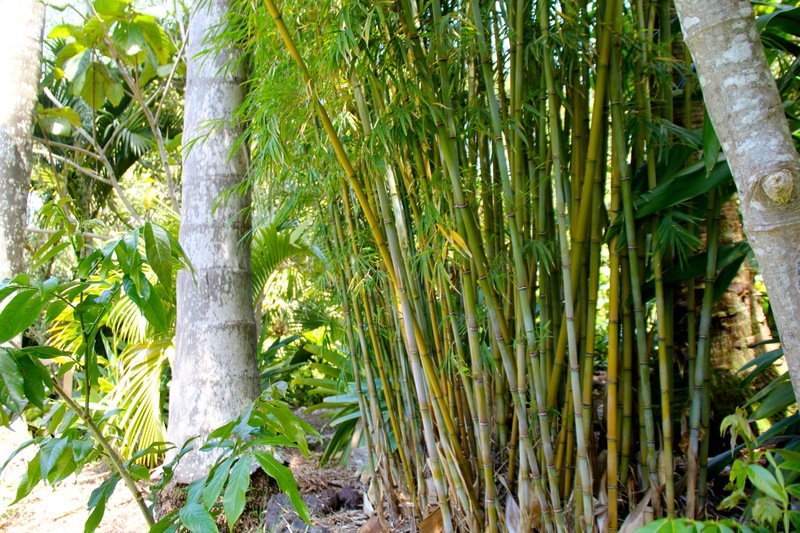 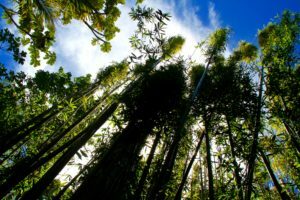 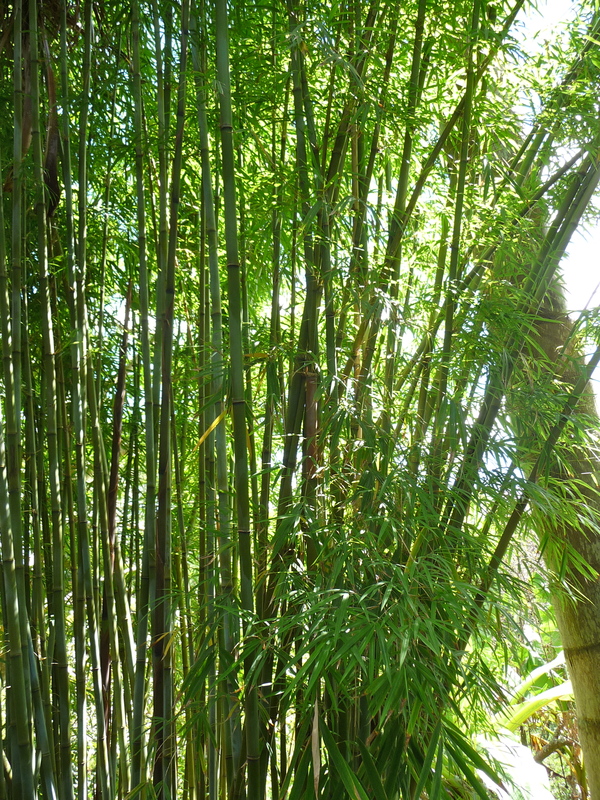 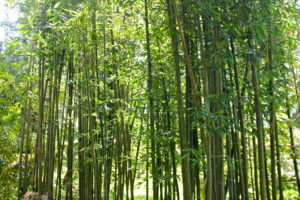 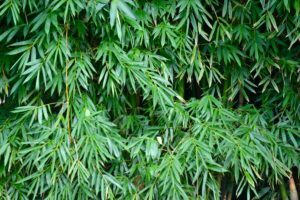 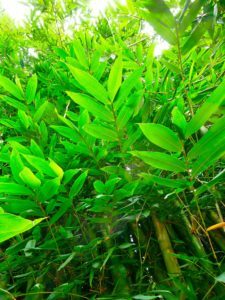 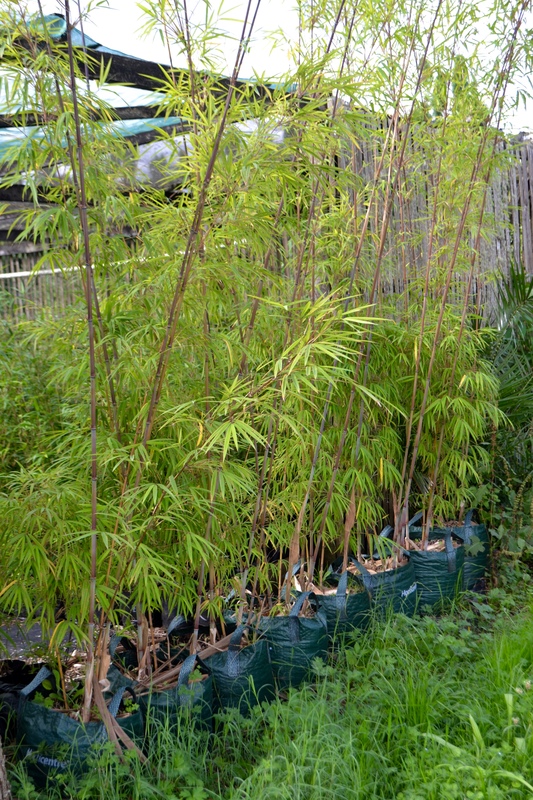 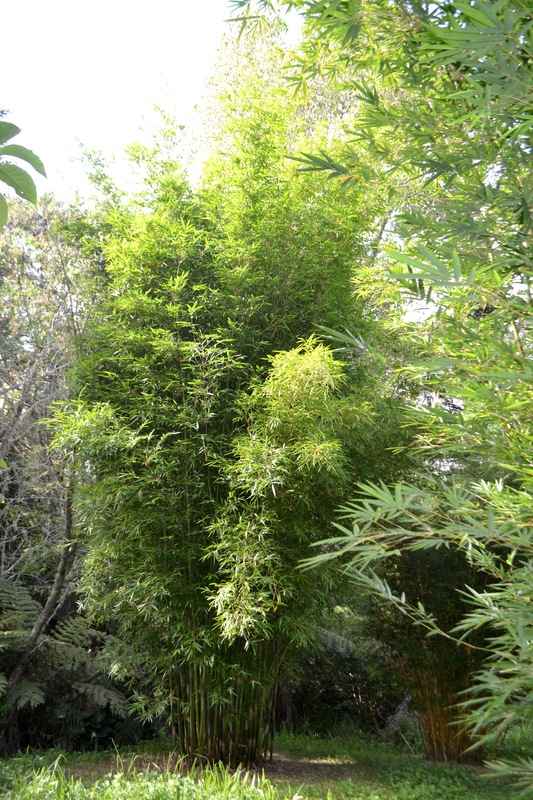 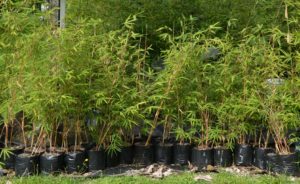 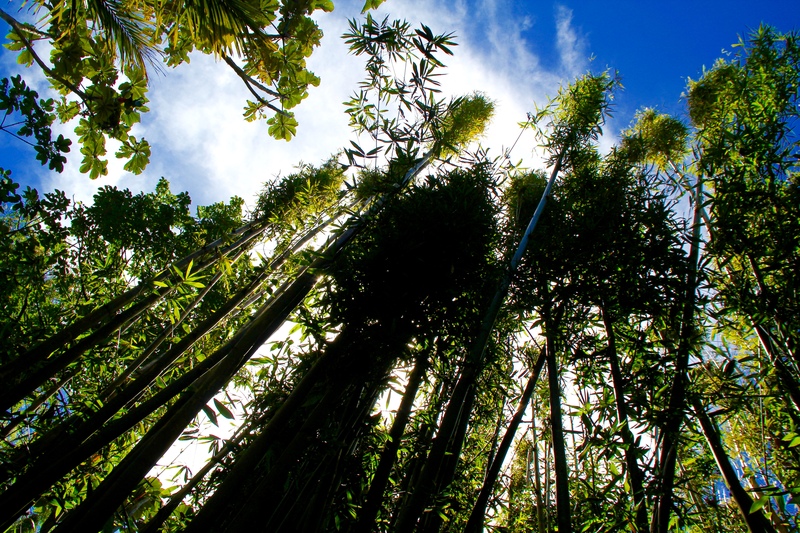 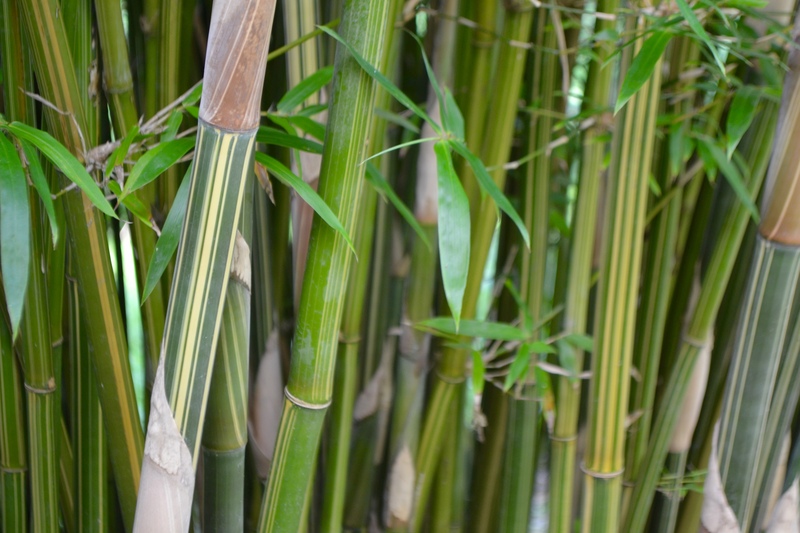 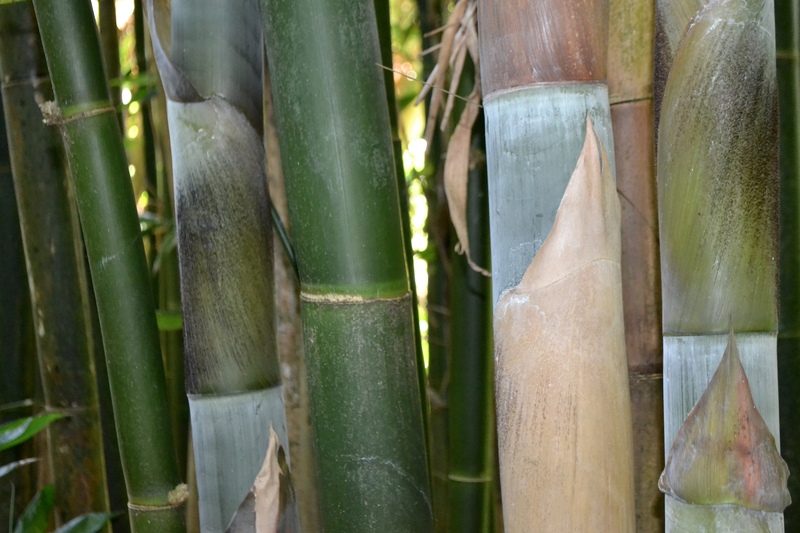 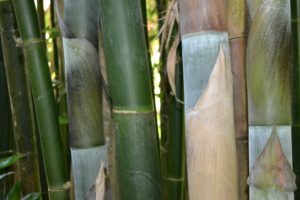 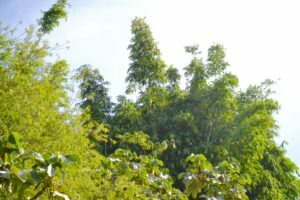 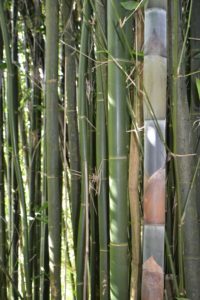 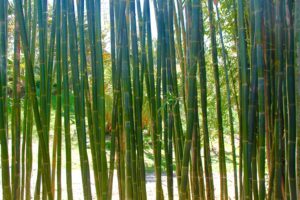 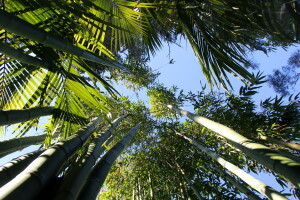 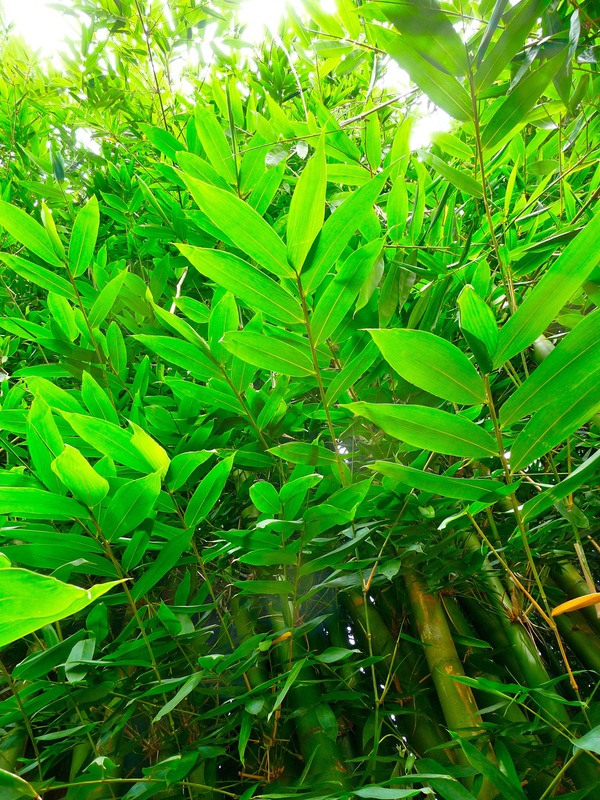 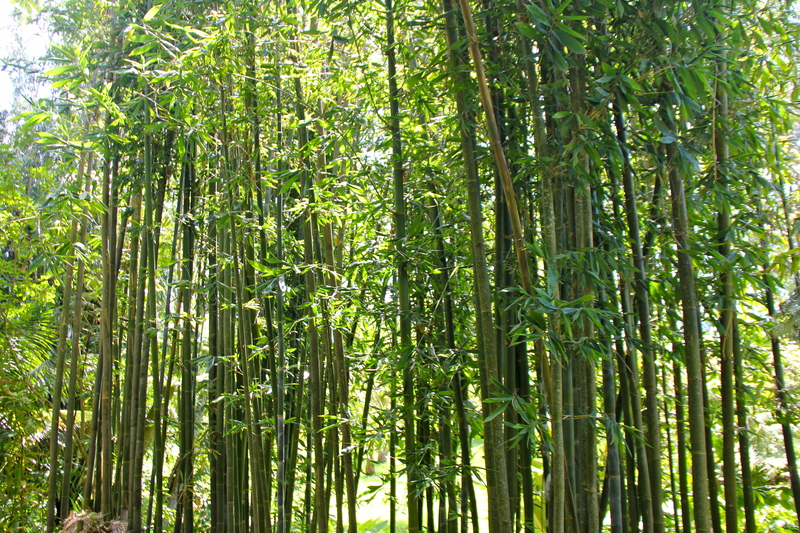 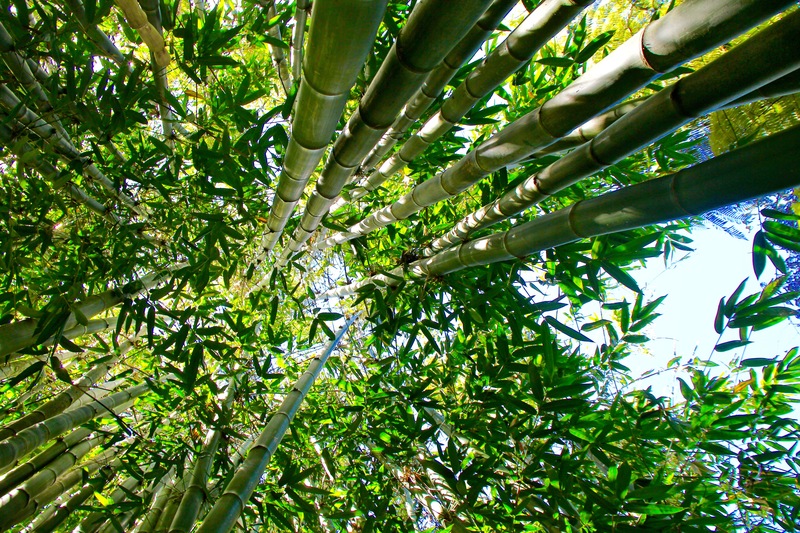 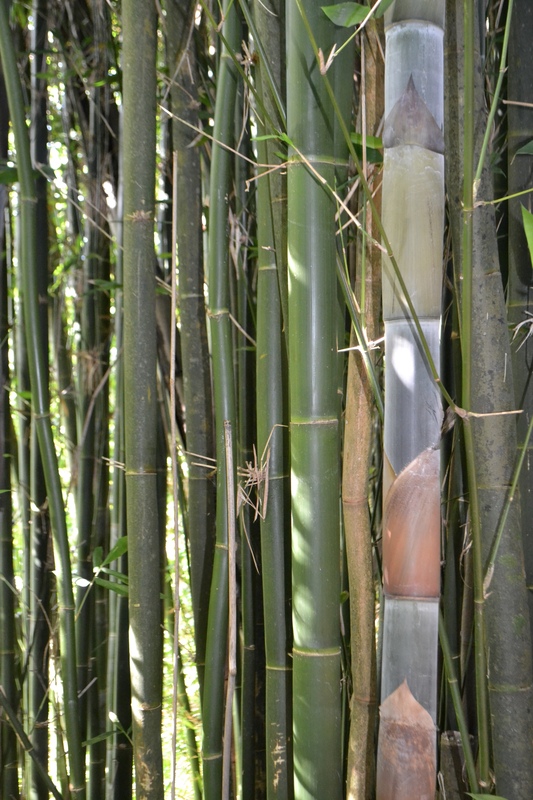 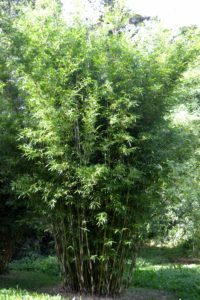 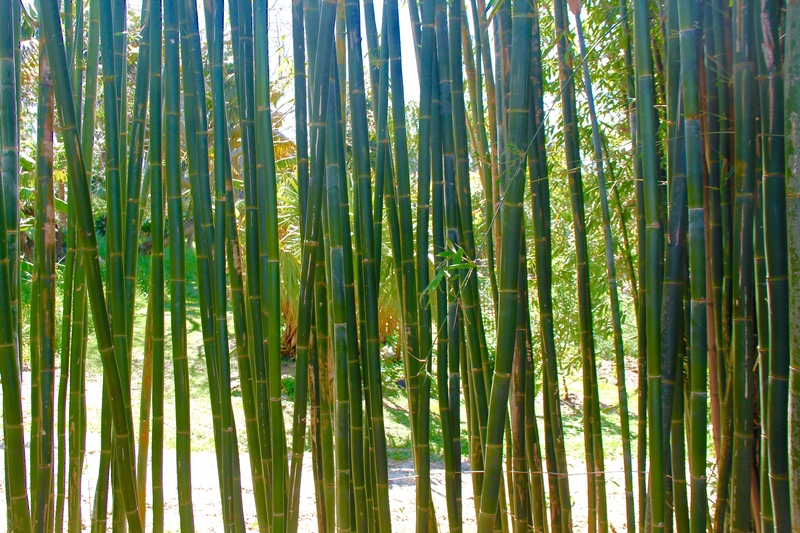 Canes exposed to a lot of direct sun will turn gold, but most – all of the green bamboos do that. 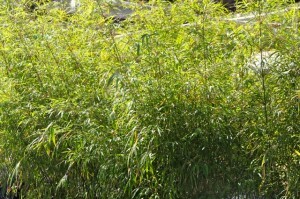 small leaves, green canes turn gold in full sun, makes a great low screen, can be trimmed easily. 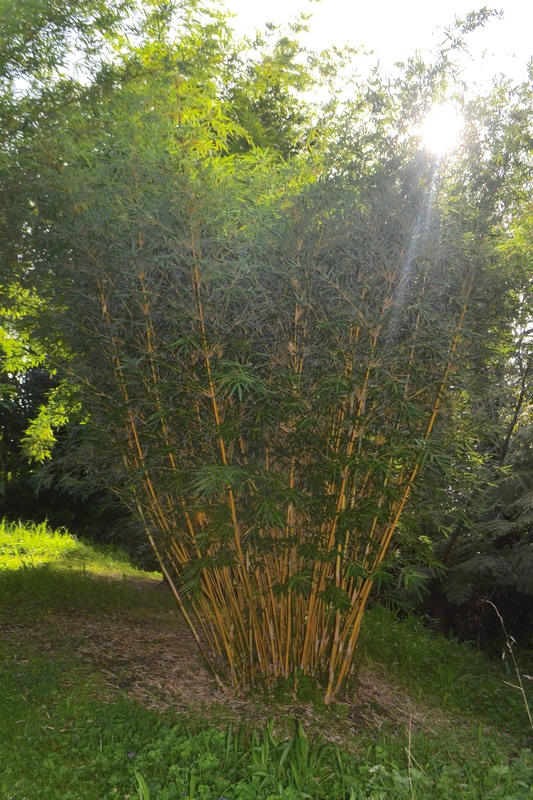 fantastic straight strong poles & edible shoots. Very beautiful, fantastic for privacy screening, new canes have blue powdering, easily able to trimmed, can be crammed into very narrow spaces without restricting their capacity to gain height. 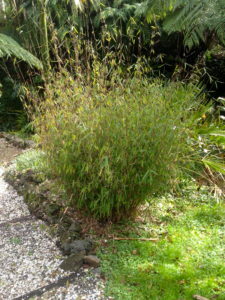 graceful habit, small leaves, makes great mid height screen. 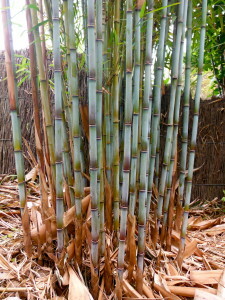 good straight slender canes for garden stakes, very thin-walled, makes excellent flexible splits. 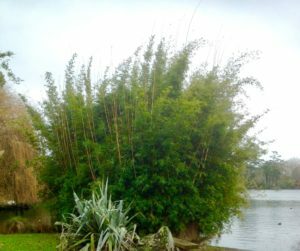 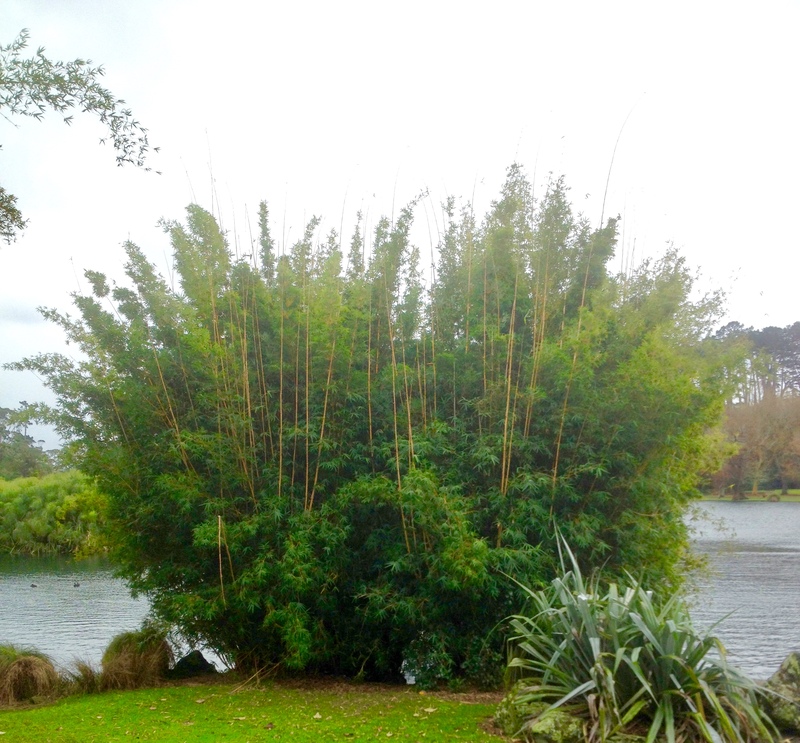 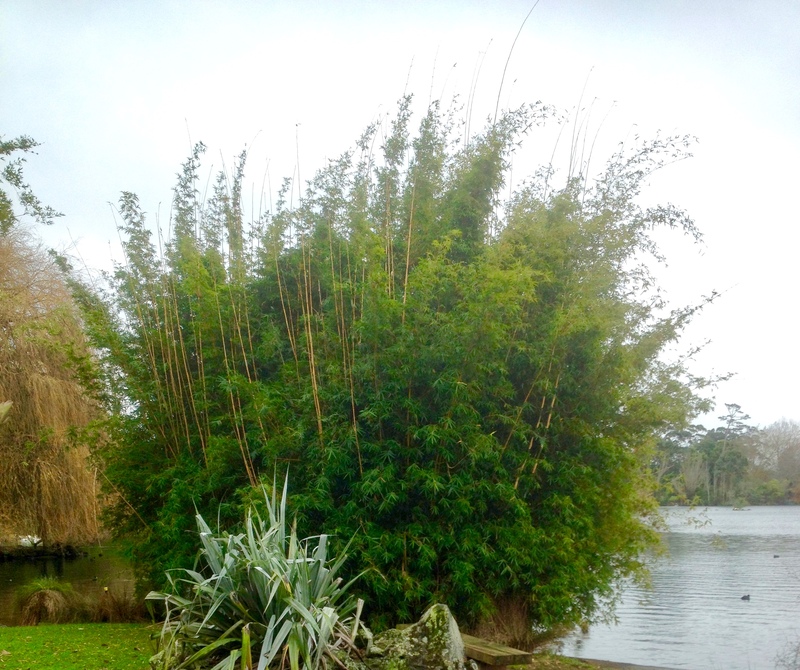 Enormous tropical clumper, largest giant bamboo in NZ. 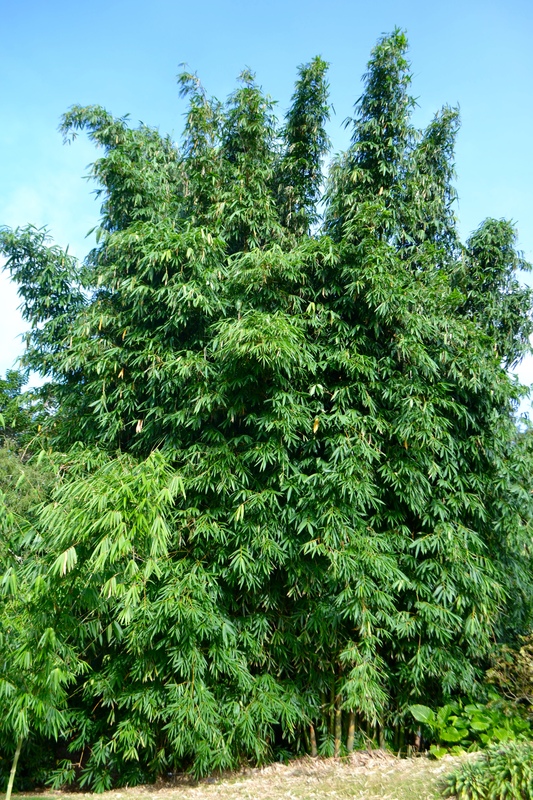 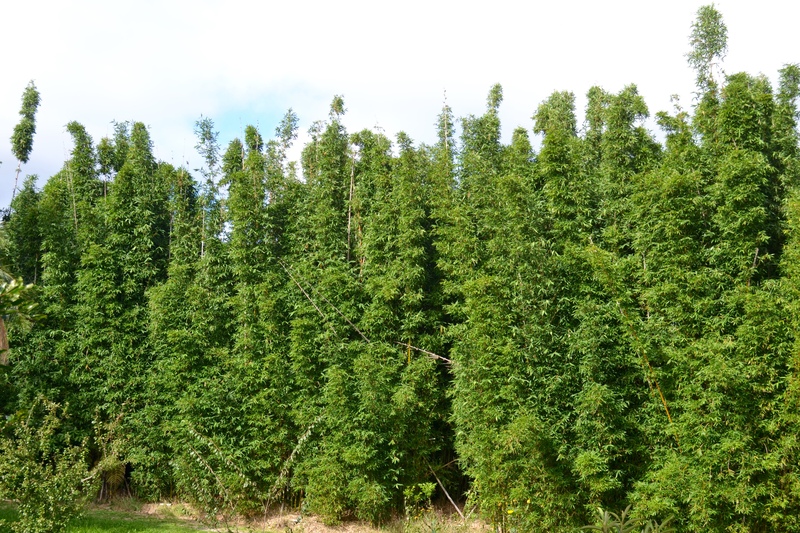 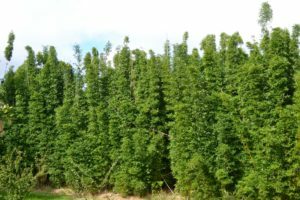 Absolutely spectacular, huge long leaves, makes excellent specimen plantings and groves. Very large, superior structural poles & edible shoots. Loves best conditions and lots of space, the huge leaves are delicate and shred easily in extreme winds, in most exposed locations. 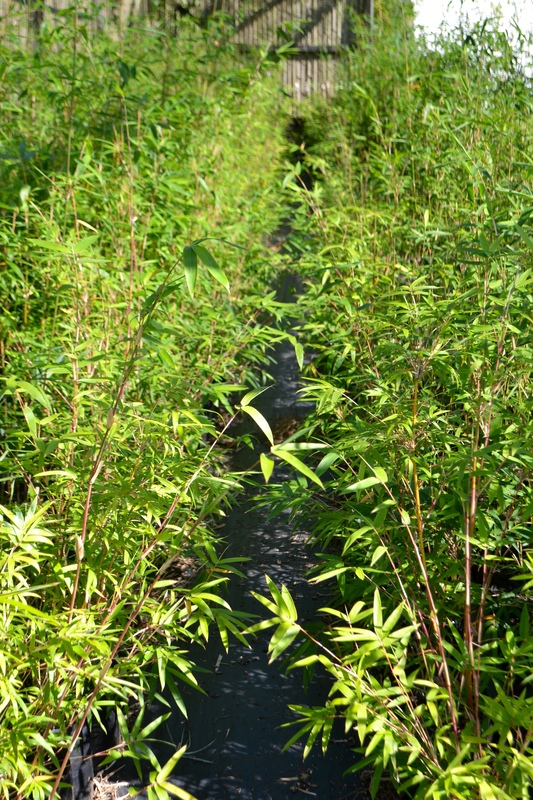 Prefers moist, well-drained, fertile soil. 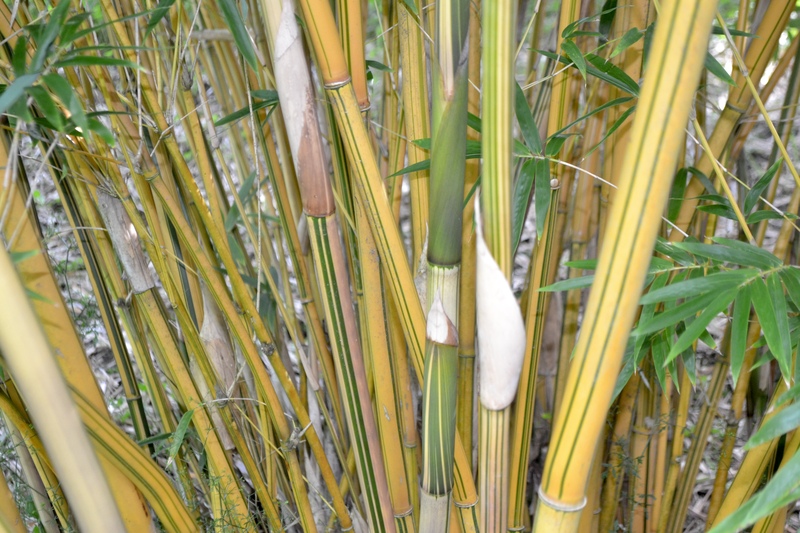 previously wrongly named Bambusa gracilis. 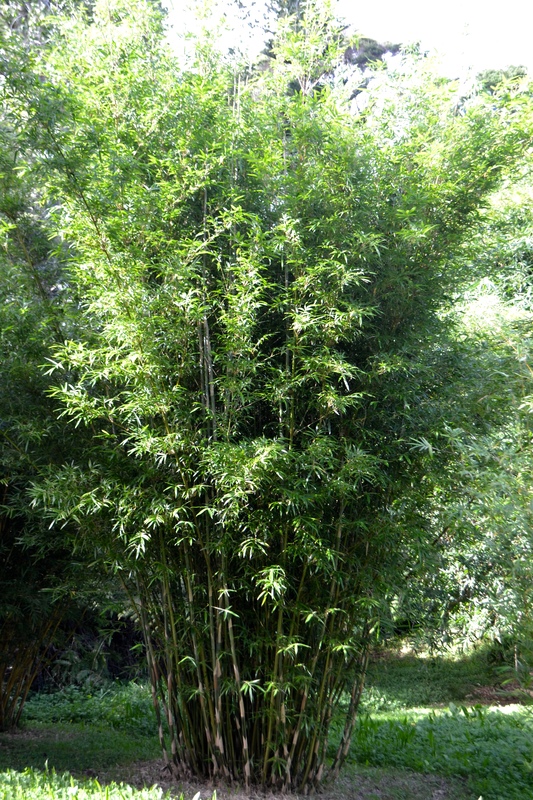 Also known as Himalayan Weeping Bamboo. 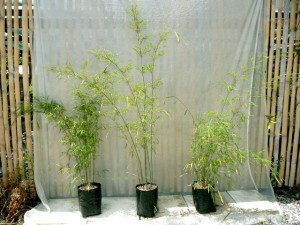 fine feathery, light green foliage with long arching canes, ideal for low screening, excellent ornamental. 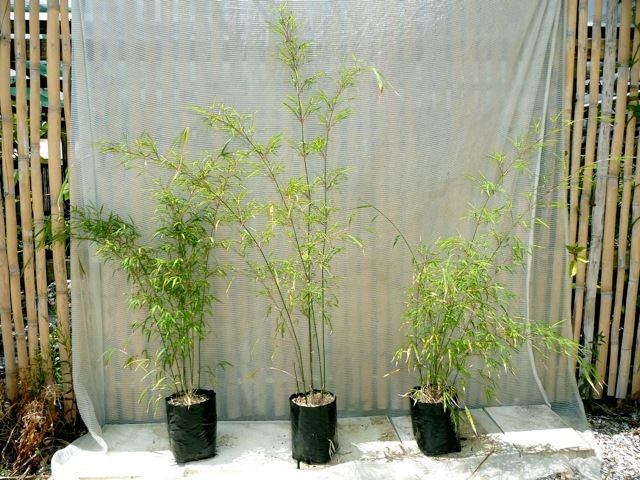 Best for protected spots and partial shade. 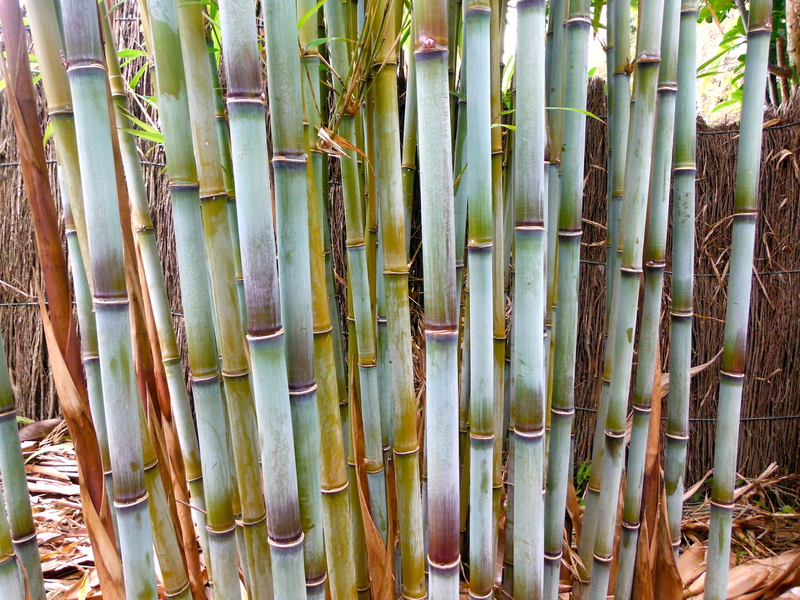 Prefers moist, well-drained, fertile soil. 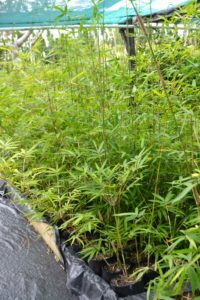 IMPORTANT NOTICE – This species is due to flower and set seed shortly (next few or so years), which means plants should end up dying afterwards, new seedlings could possibly come up after that. Such a beautiful species, but goes through this flowering cycle every 15 years. 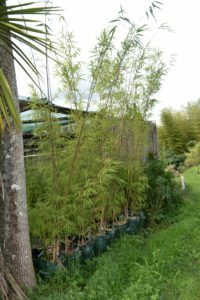 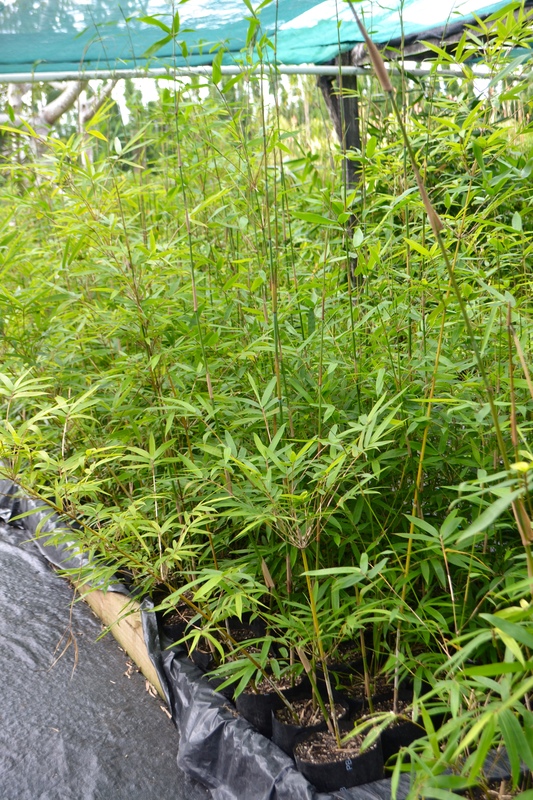 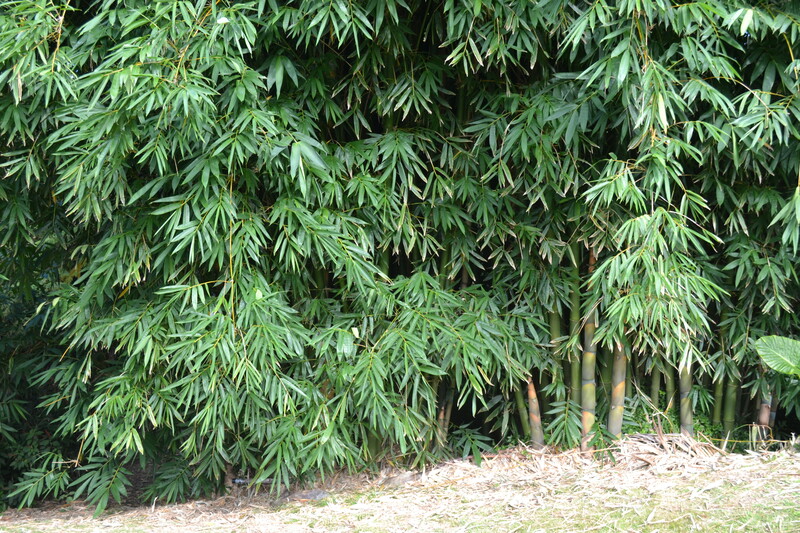 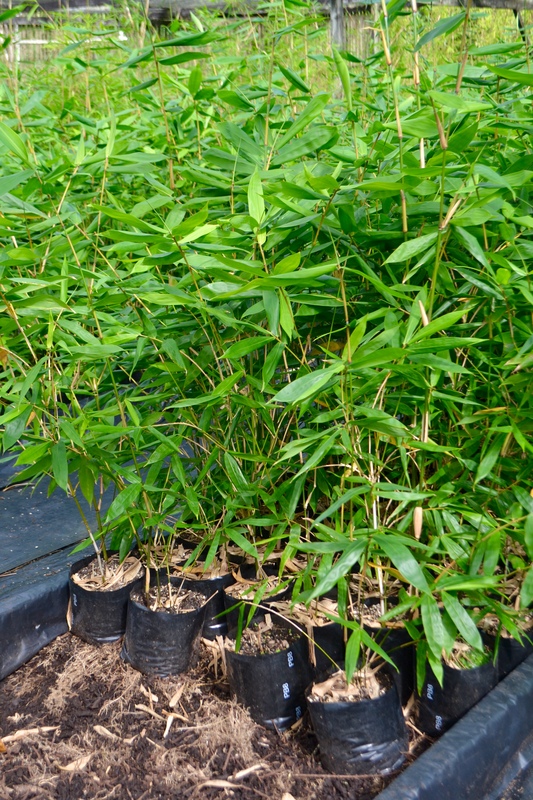 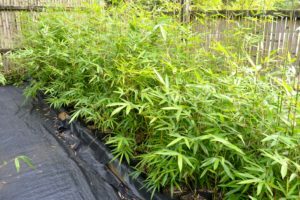 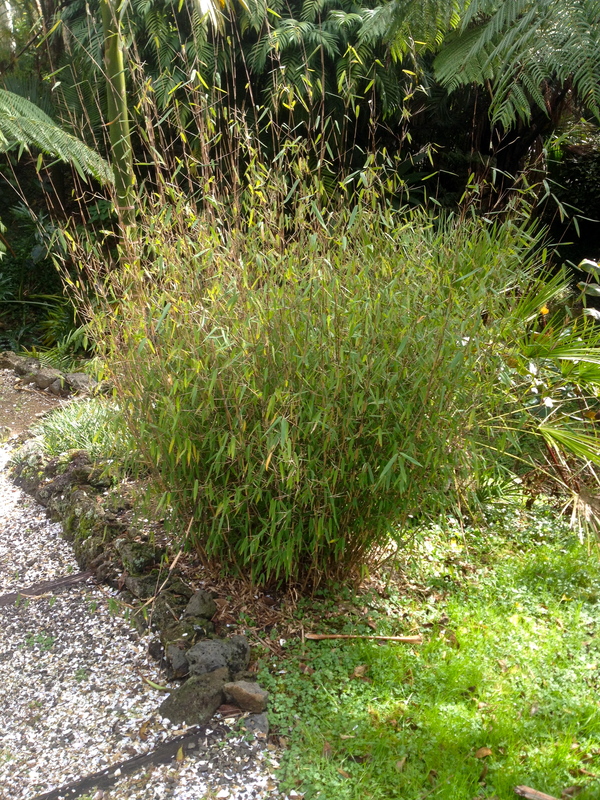 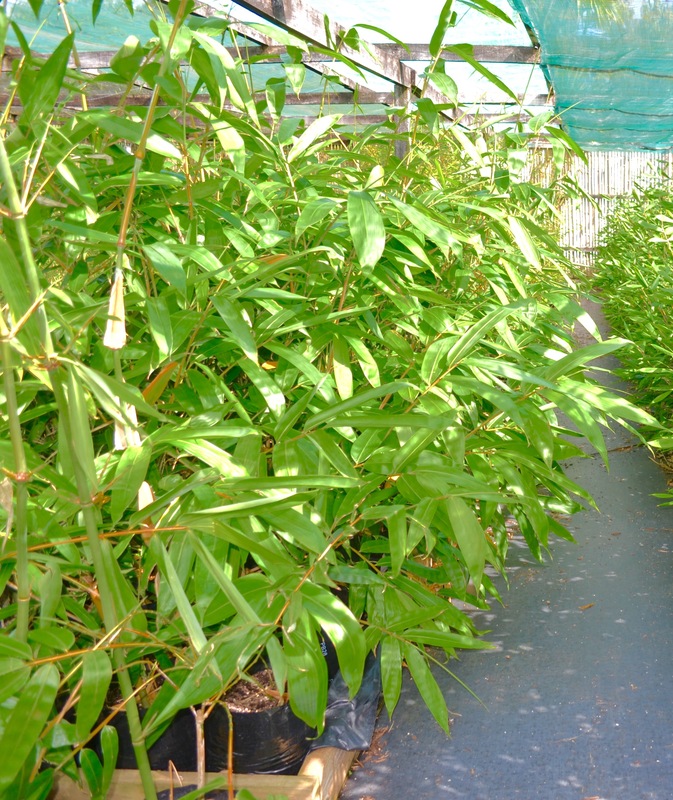 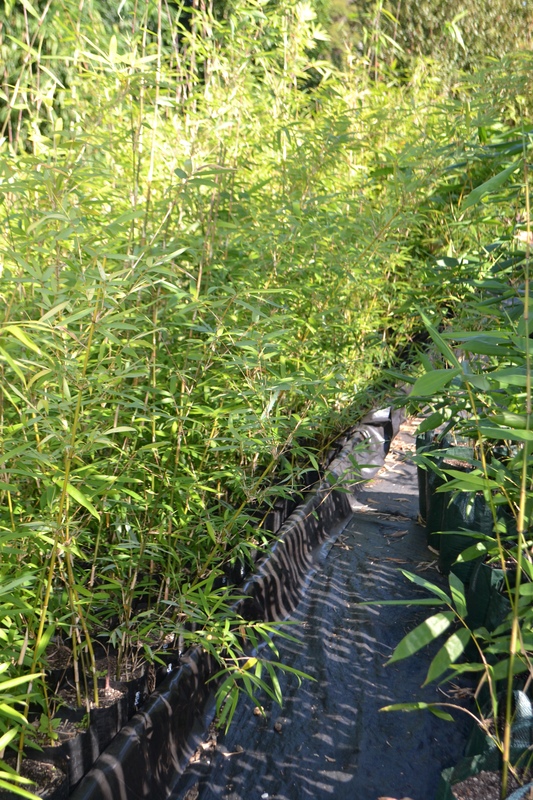 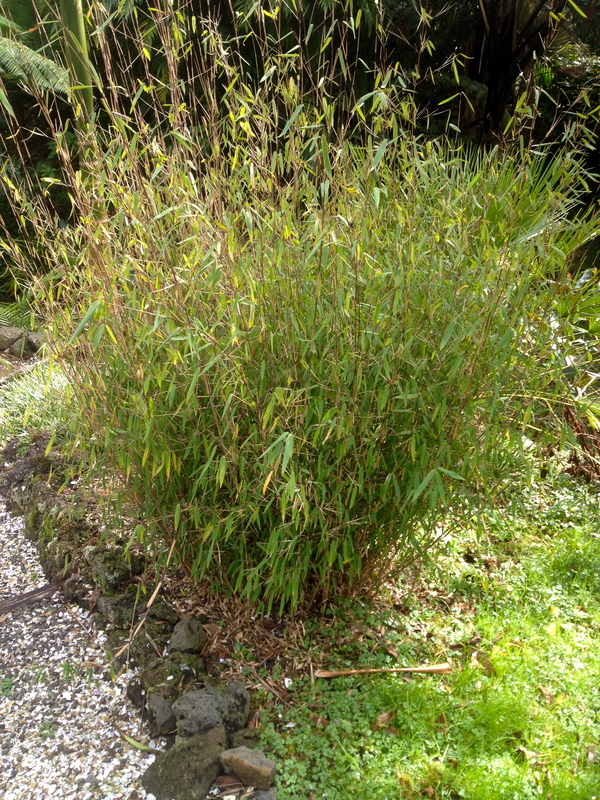 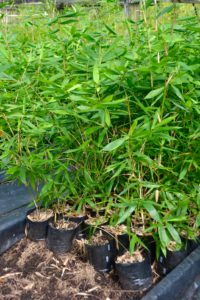 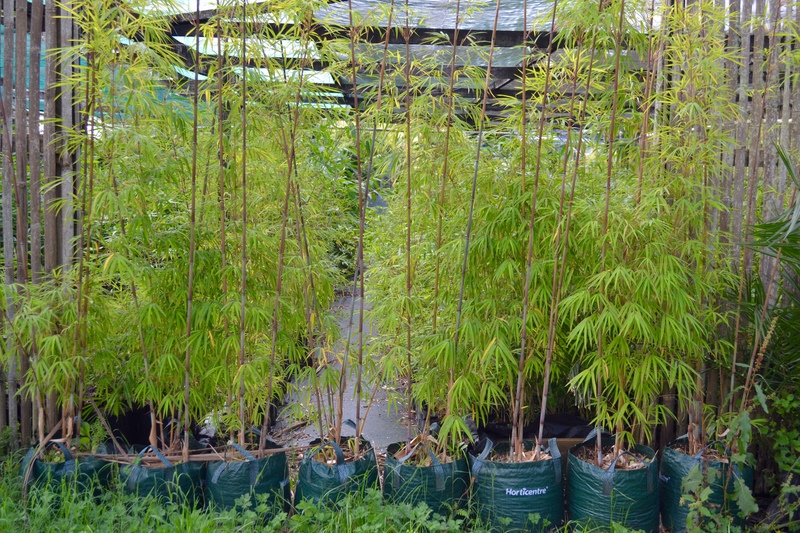 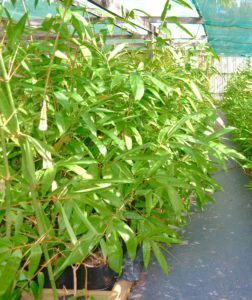 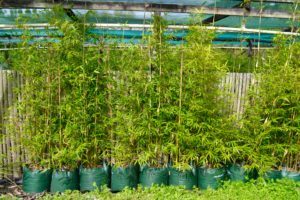 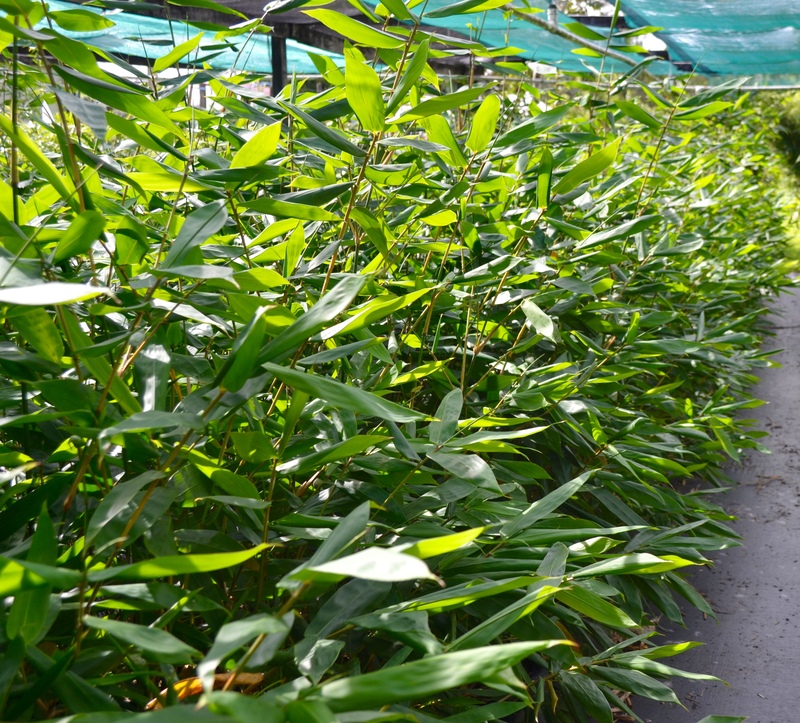 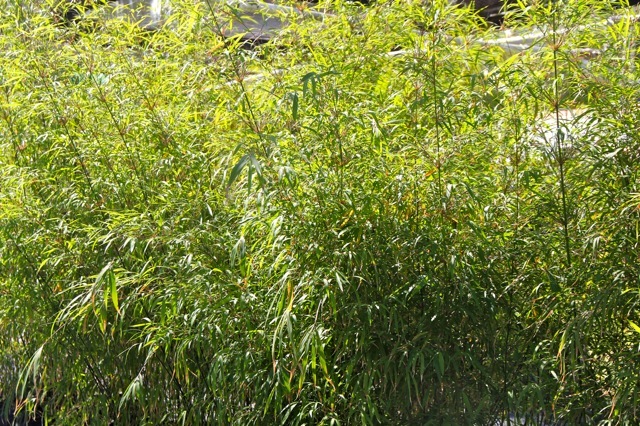 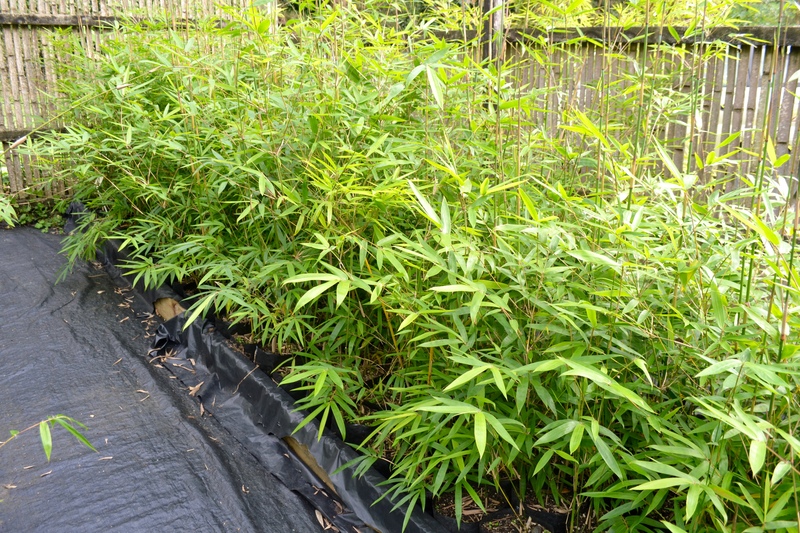 Beautiful small bamboo, worlds most cold tolerant bamboo, would be best for partial shade. 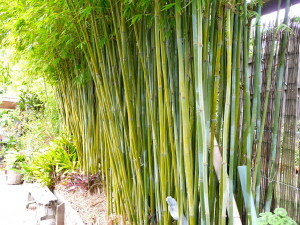 Seems it can easily be kept narrow and upright, or left to become a big arching fountain like clump. 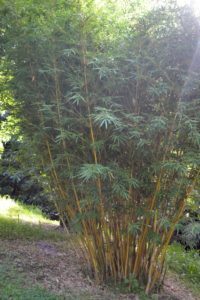 Great for low screening or as an ornamental. 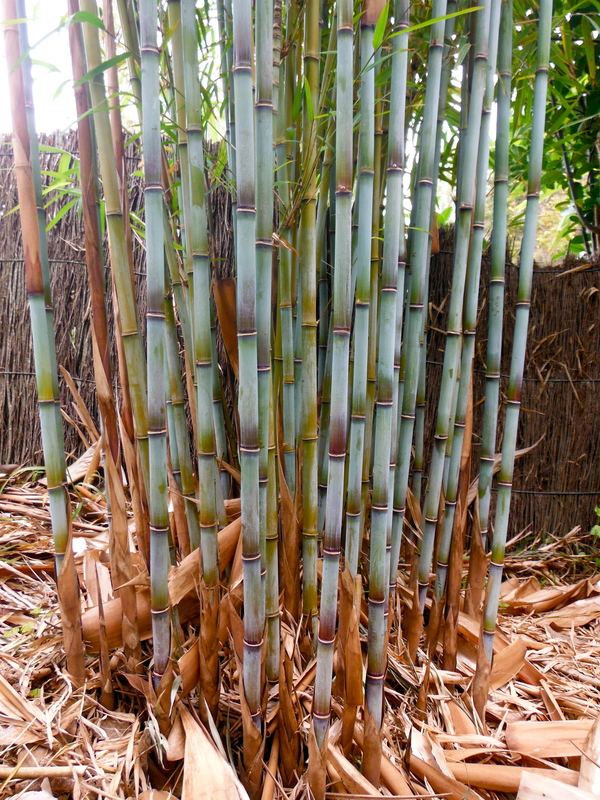 Simply gorgeous graceful habit, fine feathery, dark green foliage, new, shaded canes are powdery blue, canes exposed to lots of sun can mature to bright red. 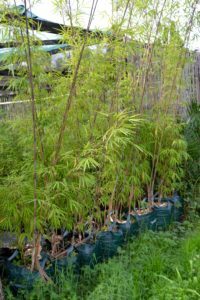 makes good mid-height screen or, a specimen planting. 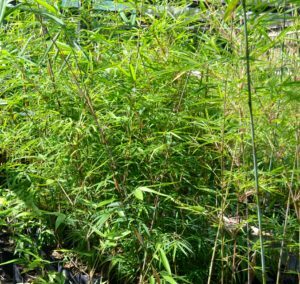 Very excellent ornamental, good screening but maybe slower to do the job than the Slender Weavers, although if in happy conditions these will still grow very fast.